You can find these guys quite easily in the Internet today. 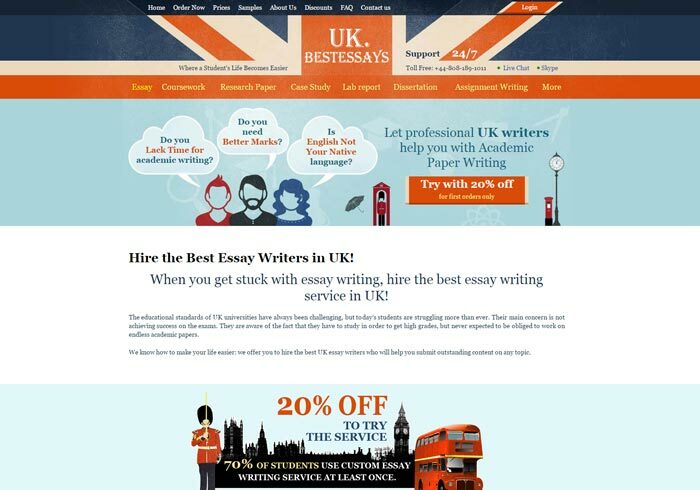 With almost twenty years of working experience, Ukbestessay.net claim to be one of the top best writing services. So, we are here to find out what their company really boast of and whether these boasts are worthwhile or just fake. As you enter the website, you see colorful home page with nice traditional British pictures and brief lists of the main company’s features. Clicking on different links and following them with respect, you gradually get to know more about the service you intend to entrust your paper to. You can find out how the services work. You discover the advantages the company is going to prove to you after you fill in their order form. You are provided with some concise information on the main features of the local services and current activity of the company. You can even take a quick look at the guarantees provided and open a pdf sample of the research paper summary for free. The ordering procedure is not that difficult, and pricing principles can be understood without the help of the Support Department. Oh, yes, and there are also discounts. By the way, what about the Support Team? Where is the chat? Your customer can still make a toll-free phone call (it is strange, however, that there are three phone numbers and only one of them is toll-free), but what is wrong with having a live chat on your website, guys? Anyway, you are glad that you have come across such service, but something still gives you no rest and you keep searching for more evidence of the company’s reliability. What can their terms and conditions tell you? The first remark may seem quite trivial, but it still has the right to exist: the text is really long. There is hardly any wish to read to the end (where the most essential issues are mentioned). Mostly, they explain a lot of things connected with various aspects of the cooperation between the company and the customer, customer management within their personal accounts as well as some details of privacy protection and revisions. There is, however, no word about payback guarantees. The company officially informs you that you will regularly receive what they call promotional materials not only from their direct representatives, but also from any third party with whom the company cooperates. the company reserves the right to ask the customers to provide photocopies of such important personal properties as IDs and bank cards, to name but a few. Beautiful and convenient interface is an important but not a determining criterion of the service’s reliability and safety. So, take the trouble and check everything carefully before you make your order here. It seems that under bright and colorful images this service tries to conceal considerable and numerous fakes which can threat the quality of your paper and your privacy.